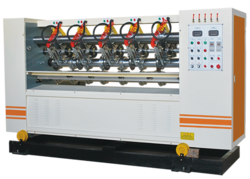 Prominent & Leading Manufacturer from Faridabad, we offer die cutting machine, corrugated box rotary die cutting machine, heavy duty die punching machine, platen die punching machine, carton printing machine and die punching machine. We are the manufacturers of Die Cutting Machine. The Die Cutting Machine can cut all sorts of materials: paper, card, felt, foam, fabric, thin plastic, cake icing – and even up to three layers of cotton! 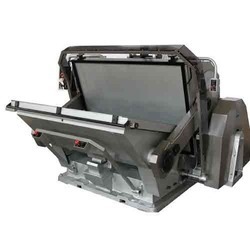 An A4 size machine, like the A4 Xpress Die Cutting Machine, works with a whole range of different-size materials. Roll Teeth Knife Pitch: 1/8"
Color: 1 to 7. Thickness: 1- 12mm. Max. Speed: 300 sheet/min. Optional: Slotter. Die-cutter. Varnishing / UV / IR / Hot or Cold air Drying. Waste Covenyor. Doctor Blade or Rubber Roller. Ceramic Anlix or Metal Anilox. Gear transmission system or Servo driving system. Service: whole plan design, training and coaching. CLASSIC, Semi Automatic Manual feeding Platen Die Punching Machine with hand safety device with control panel accessories. 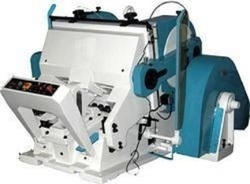 To fulfill the varying needs of the clients, we are offering NEW 4 BAR ROTARY CUTTING & CREASING MACHINE which is exclusively designed as per their specific requirements. It is highly suitable for the industrial applications owing to its quality as per the international standards, robustness and optimum performance for longer time. 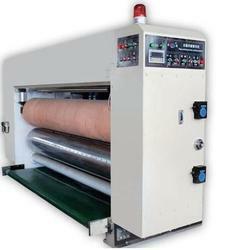 The thin edge slitter used for corrugated board production line can be provided.